Think Being Green is a Rural Thing? Keep Virginia Beautiful says NO! Think being “green” is a rural thing? Being green isn’t always easy or pretty. When we think about making a difference in our environment, we often think of things like sustainable energy, recycling, and planting trees. A mental image of a Green Virginia conjures up thoughts of rolling hills and clear, cool streams. But what if you live in a city? I live in Richmond’s Fan District and discovered a jewel very near my house. I was coming out of a favorite carryout spot and decided to take the alley as a shortcut. 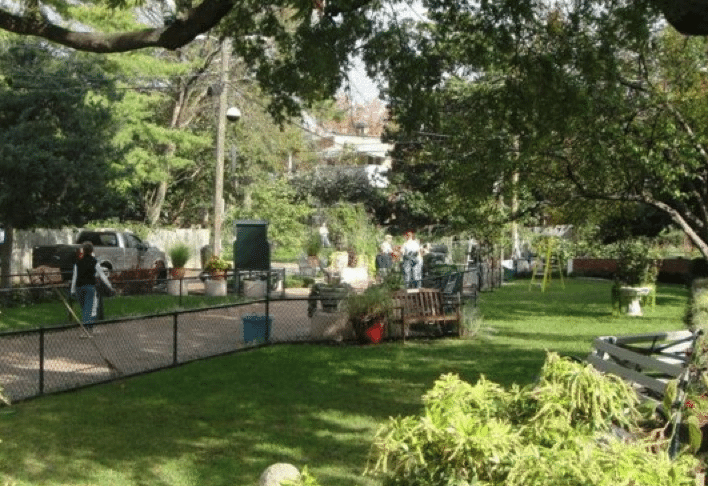 Imagine my surprise when upon reaching the end of the back of these homes I found an amazing oasis, right in the middle of a dense urban area! I had happened upon Scuffletown Park. There were tables and benches, a long expanse of grass, and flowers everywhere. What was interesting to me, however, was the large compost pile at the edge of the park. As I admired the park, I saw a resident load up a wheelbarrow and take it to his backyard. His property bordered the park, and as I walked over to admire it I noticed that all of his neighbors had planted theirs as he had, with tomatoes, lettuce, and other tasty vegetables. It seemed that every property on this block had a garden, a recycling bin, and a hand in maintaining and appreciating Scuffletown. It’s really not that hard to contribute to Keeping Virginia Beautiful if you live in a city. When we did our 30 in Thirty Grant program, many of our grant winners were in urban areas. And we’ve posted before about rain barrels, container gardens, sprucing up your piece of the sidewalk, and flower boxes. But can you do more? Can you be like the friends of Scuffletown or even a rural farmer? In addition to easy things like recycling, reusing, and making things pretty, you can start composting! We found this great article that offers tips for doing it in an apartment. They even have some links for worm composting! In your apartment! Some folks in the Washington area are starting up a service called Compost Cab. You save your food scraps and they come pick them up. They provide a bin, and take your scraps to a farm in College Park, Maryland. If you’d like, they will bring you back some nice compost for your own garden. Everything else goes to the urban farm in Maryland. Do you still think that it’s too hard? NOPE. That stands for Natural Organic Process Enterprises. Their goal is to divert organic products away from landfills. Organic waste breaking down in a traditional landfill creates methane gas, a big contributor to global warming. They partner with a few other groups to make this easier for you. And don’t think that running a business means that you have to sit on the bench! Greener Results won’t come pick up your trash for you, but they have a team of great people who will advise your business on how to make it more sustainable. They can work with traditional office-based businesses, they have experts in restaurant and hospitality industries, and have done wonders for some manufacturers. In addition to helping you develop a plan, they can work with you to design a web tool that will track and report your progress. It doesn’t matter if you live in a city or in the country. You may have a house full of people or live by yourself. You may have a small, private business or a huge company. If you’re here in Virginia, you can still make a difference and help to Keep Virginia Beautiful.